I get asked a lot about how long I have had lyme and what are my symptoms. I don’t like answering this question because there are too many symptoms to list and I forget what most of them are because I have been dealing with them so long I think they are “normal”. Below is a list I posted a couple years ago of a good majority of my symptoms from lyme and co’s but I know there are many symptoms missing. There are times when other lymies who have one or two symptoms will ask me “why can’t you work, I can” as if they think lyme is curable and only has a few symptoms but they have no idea how much worse lyme can get if untreated your whole life or once it is stage 3. This disease is a living hell and it is different for every person so it is hard to compare or give advice to others when we all have different battles with the same disease. **My pain from the bottom of my feet to the top of my head is daily (24/7) and severe (pain scale 10++) but most of my pain is caused from other illnesses or medical issues plus the lyme and co’s. Here’s an older list from last year. Some may repeat sorry. I know I left out many symptoms since there are 100′s but of course I am struggling to remember them all. Some of these may not even be symptoms but illnesses causing them. If you name a lyme disease symptom I most likely have it. I just don’t have the genital pain like I see listed on lyme disease symptoms checker at my LLMD. I usually check mark every box on the symptoms sheet at the doctors (those who see an LLMD know the long symptoms list we have to fill out each time. I rarely leave the house usually only to get a prescription with my mom or go to a doctor appt. I have been bed ridden but now I am able to walk to the living room and lay in my chair or walk around the house. I lost the ability to walk and was in a wheelchair but I will not let Lyme beat me! I am planning a vacation so I hope to get out for the first time in years. 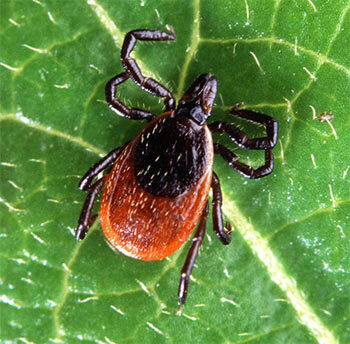 As for me I have had lyme basically my whole life and always thought everyone had the same pains and weird things going on in the body as I did. I didn’t start to get worse until maybe my teens and when I was 19-21 that is when everything started to snowball and get worse. Started with bad knees, arthritis, spinal stenosis, nearly died from elderly pneumonia and so on. I worked and went to college until I finally collapsed and could no longer keep up with the world 5 years ago when I became officially disabled. So if you have only a few symptoms and think it won’t get any worse it most certainly can. So treat your lyme as much as you can and as early as possible for a better chance of remission. This all sounds depressing but we will all get through this and we will not let our illnesses define who we are. Never give up and never take your life or health for granted because you never know what can happen. Stay strong, love life and fight on! 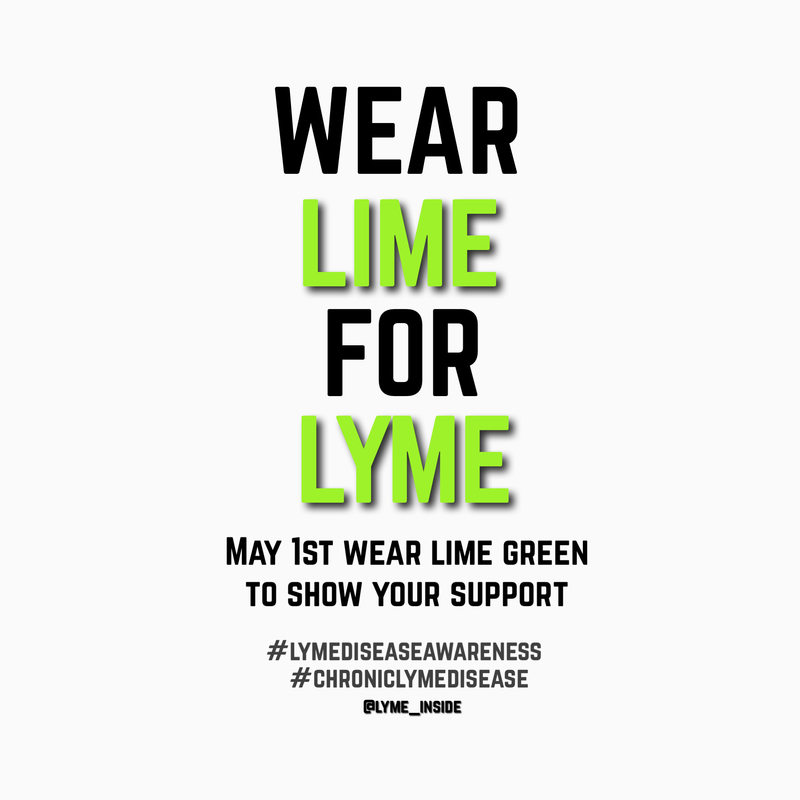 A little late with my campaign picture above I made but today was wear lime for lyme. As you may or may not know (no pun intended) May is lyme disease awareness month and many other illnesses like gatroparesis and lupus (which I have). Make sure you spread awareness and show your support. A couple years ago I had a story on the front page of my local paper warning people about tick season. It takes a lot of energy or spoons to help spread awareness but I think if we keep at it lyme will be taken more serious. So on Easter we had my sister, a friend and kids over. I rarely leave the house, go in public or am around people due to my immune. So a day after Easter I started to feel sicker. One of them gave me a bug. I have a sore throat, lost my voice, fluid in lungs, darker colored mucus. I have been taking claratin and doxycycline for now and I am feeling a little better bug wise. As far as lyme and my illnesses still lots of pain and haven’t been doing so well. I try to keep up when I can. I hope all of my readers are finding relief and better days. Keep up the fight!